Traudl Junge a fost crescuta doar de mama sa si a tanjit dupa prezenta paterna. In 1942, dorinta i-a fost indeplinita – Fuhrer-ul insusi a angajat-o ca secretara sa personala. A lucrat pentru Hitler pana in 1946, cand acesta s-a sinucis, dupa ce ii dictase tot ei, testamentul. Aceasta poveste a fost tinuta secret aproape 60 de ani. Totusi, la 81 de ani, Junge s-a decis sa povesteasca totul in fata camerelor de filmat. Din cele peste 10 ore de confesiuni, Andre Heller si Othmar Schmiderer au realizat un documentar de 90 de minute, care a fost prezentat in 2002, in cadrul Festivalului de Film de la Berlin. A doua zi dupa premiera, Trauld Junge a murit. Doi ani mai tarziu aparea pe marile ecrane filmul „Ultimele zile ale lui Hitler“, film inspirat din memoriile secretarei lui. Daca ati vazut-o pe Alexandra Maria Lara in acel rol, acum aveti ocazia sa o vedeti pe adevarata Traudl Junge. Traudl Junge was a well-mannered Bavarian girl raised by a single mother, who yearned, she recalls, for a father figure to enter her life. In 1942, her wish was fulfilled: in Berlin, the comely 22-year-old landed a job with Der Fuhrer himself, hired to type his speeches and correspondence. She remained in Hitler’s employ until his suicide in 1946. It was to Junge that Hitler dictated his final will. This amazing story was kept hidden for almost sixty years, until, at 81 and knowing death was approaching, the conscience-struck Junge spilled all for a documentary camera set up in her Munich apartment. Behind it stood Andre Heller and Othmar Schmiderer. 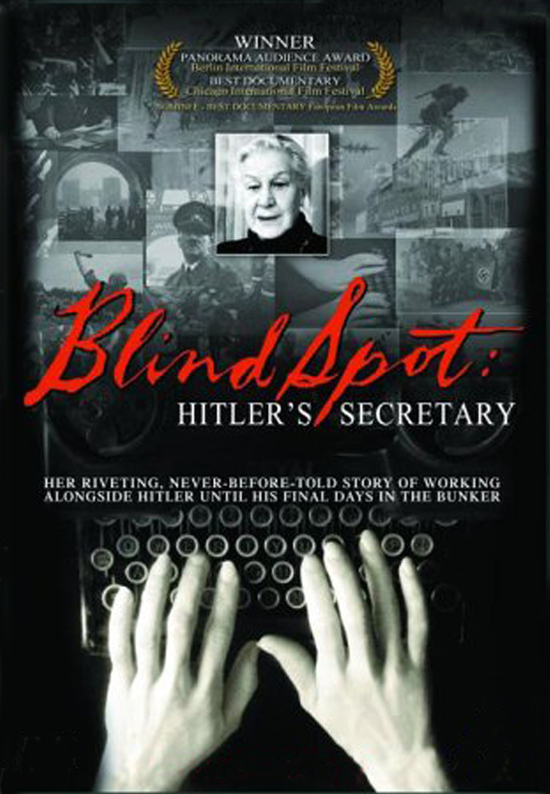 Blind Spot-Hitler’s Secretary, shrunken by the filmmakers to 90 potent minutes from ten hours of confessional interviews, premiered at the 2002 Berlin Film Festival. A day after, Frau Junge died of cancer. Two years after, the feature film „Der Undergang“ was a success throughout Europe. Alexandra Maria Lara, the Romanian actress, played the young secretary. This Monday at the Czech Centre you’ll „meet“ the real Traudl Junge.